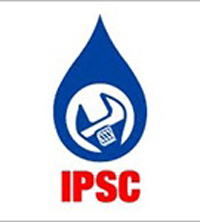 IPSC is a company incorporated under Section 25 of the Indian Companies Act 1956 . The IPSC acts as a accrediting and certifying body; and will work to fill the gap of skilled and unskilled labour in India. NSDC aimed to form Sector Skills Councils (SSC) to bridge this wide gap between the demand and supply side of the skilled workforce. IPSC is playing an important role in vocational training of plumbers, providing recognition and certification to Plumbers in accordance to National Skill Qualification Framework (NSQF).To make skilled manpower available for the Plumbing Industry from the entry level upto level 10 i.e. Ph.D (Doctorate). 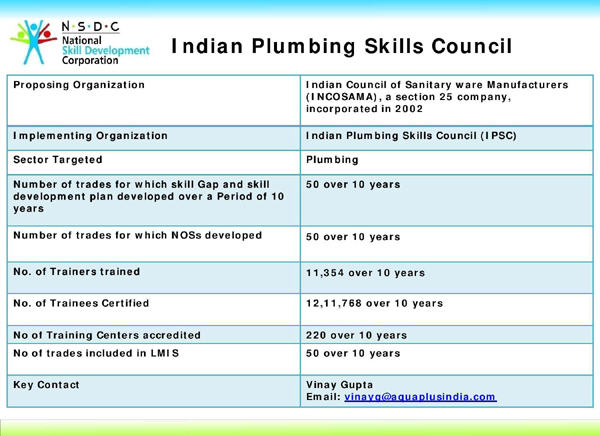 Indian Plumbing Skills Council (IPSC) with support from National Skills Development Corporations (NSDC) has taken up initiatives like Development of National standards of Plumbing Education, Curriculum and Certification and through the mandate of the National Skills Development Corporation (NSDC) has got an excellent opportunity to train its workforce with the latest skills and technology and best practices in the Industry.